St John The Baptist church was built in the 11th Century and remodelled in the 14th. The window is on the north wall, directly opposite the south entrance and the font. At the top is a sun/son motif, constructed from three thorn-like shapes. The sun therefore offers a symbol as a crown of thorns, and also evokes the Trinity. This motif is echoed in the waters of the river that flows from top to bottom of the window. 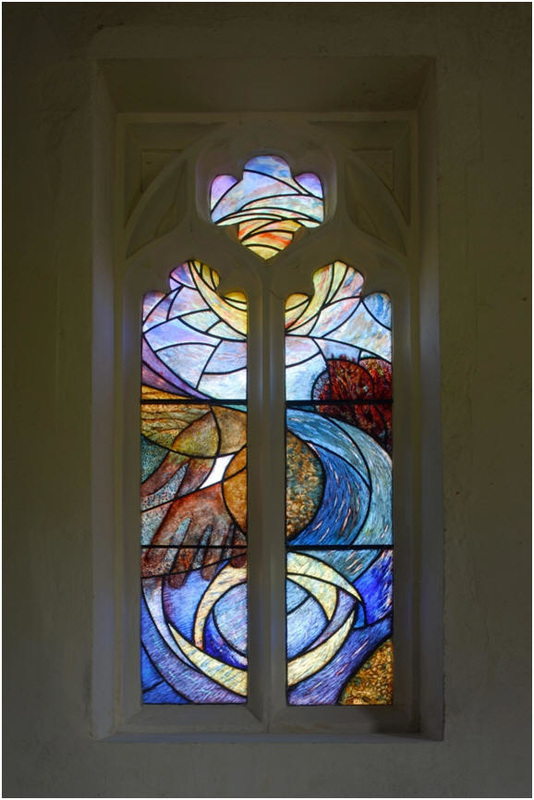 By repeating the motif, the river becomes the place of Christ’s baptism, and an invitation to the viewer (Mk 10.39).Below the sun (which visually binds the three sections of glass together) we see the first glimpse of dawn on the horizon. To the right is a flaming tree, symbolic of the Spirit. Below the horizon and revealed in creation, is the ‘hand of God’ (carved on the door jamb of the South porch). Yet this hand of God has become at once the hand of Christ: his wound is seen as a piece of clear (‘white’) glass, through which the fields beyond can be seen. Thus Creation is revealed through the wounds of love. The fingertips of the hand touch the river, guiding us safely through the trials of life and the journey of death, as symbolized in the story of St Christopher, a traditional theme for medieval windows. In the bottom right hand corner of the window is a small area of ground, from which our journey through the meaning of this window begins. Finally, in the right hand light, a swelling shape of land resembles the curve of a pregnant belly, as all creation waits with longing and hope for Christ’s return.